This is another random item from the collection, a double-sided poster for Cybermage. 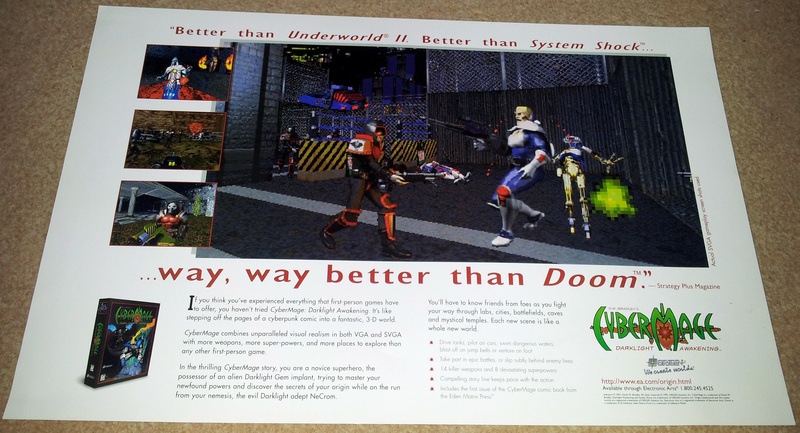 It’s small in stature being around A3 size, but big on hyperbole proudly proclaiming “Better than Underworld II, better than System Shock, way way better than Doom.” That would be a bold statement for any game but to be fair it’s a magazine quote saving Origin from any false marketing claims. The Strategy Plus reviewer must have truly loved this game. This isn’t the most decorative of posters although those SVGA screenshots would have been a whole lot more impressive in 1995. I have a small pile of these in a drawer so if anyone fancies owning one for the price of postage & packing, let me know. 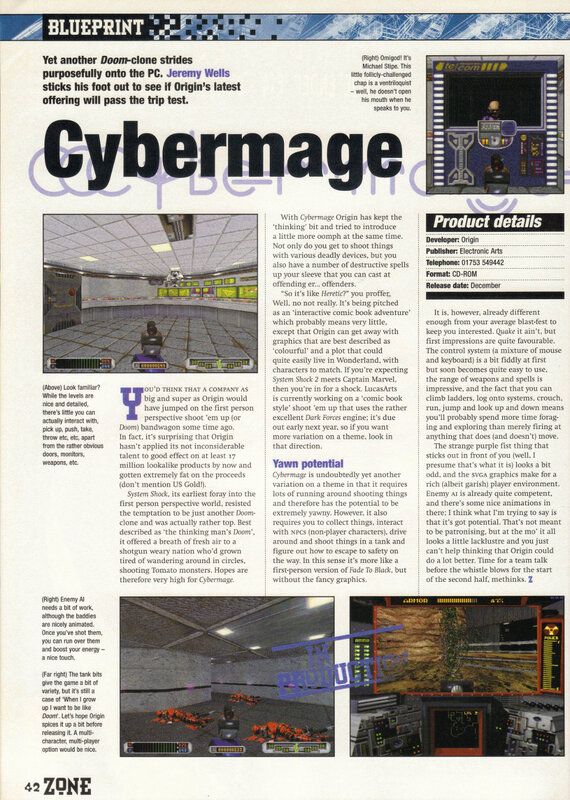 I dug out this Cybermage demo from the December 1995 PC Zone magazine cover disk. No doubt it’s available online somewhere but now you can also grab it from here. 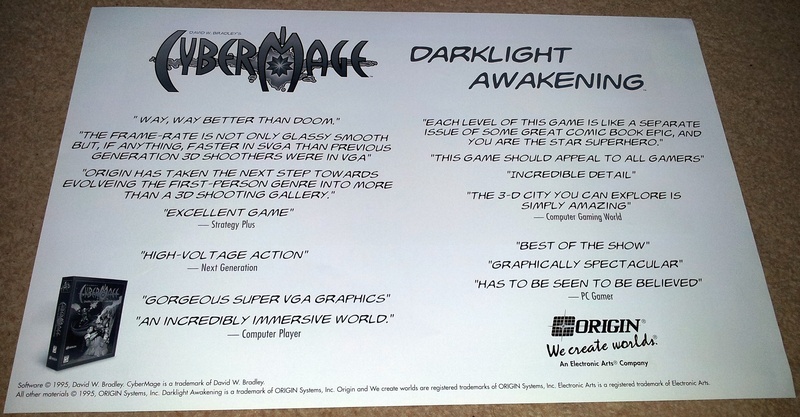 Cybermage is probably one of Origin’s least well-known 90’s games but it deserved to make more impact than it did. It was their only pure FPS (although they got fairly close with Shadowcaster and System Shock), but in typical Origin style it is far more than a Doom clone and incorporated a storyline, magic and conventional weapons, an inventory, an actual plot, the ability to control vehicles both on the ground + air, and finally SVGA graphics. I presonally prefer it to Half-Life but there don’t seem to be many people who have even heard of the game. For all this, I didn’t buy Cybermage until years after release despite already being something of an Origin fan boy back then. Admittedly I was an impoverished student and couldn’t afford many new titles until I’d started to earn my own way in the world. I do remember playing the demo but I recall finding it quite difficult at the time and not being all that impressed. Having just played the demo for the first time since 1995, I fully understand why I didn’t buy the game as the demo does a terrible job of selling a great product. First I’ll go for the good points. The demo is played on an original level designed to show off the features of the game. The plot involves shutting down the combat training facility, penetrating the main fortress and verifying NeCrom’s involvement in some dastardly deeds that aren’t described in the brief text file instructions. Since it’s showing off the game (in theory), the level includes both tank driving and flying car piloting which were both cool features at the time when you compare it to the opposition. The demo level is huge, took me ages to play through and features loads of weapons and powers from the main game and plenty of varied terrain. Now the bad points. First and foremost, the options menu in the game hasn’t been implemented and all the keys and controls are unchangeable. Not necessarily a big deal, if the chosen keys weren’t so impossible to use. Many standard commands involve combining keys even including bringing up the help menu! I understand that WASD wasn’t standard back then, but these have to be among the worst FPS controls I’ve ever seen. I had to play through this demo without strafing, which is never a good idea in any FPS. The demo has limited sound card support and at the time I originally played this I’d have been stuck with adlib. I was never that keen on adlib but the music in this is truly awful without general MIDI. I found playing the demo level seriously hard and there was a lot of reloading after I was killed. This is made more frustrating than it need be by a lengthy pause between death and being allowed to reload. The demo doesn’t appear to have the same speed controls as the finished game and the enemies tended to move a little too fast at times in DosBOX. I wasn’t able to alter mouse sensitivity either, which was another major factor in the difficulty as I had to use an unnatural combination of keyboard to turn and mouse for fine tuning my aim. At no point in this demo map was I aware of any plot or goals. I just meandered around shooting stuff and trying to find new areas. A lot of backtracking was involved to find locations that the last item I discovered would open. The backtracking is to some extent a difference between modern and old FPS’s but the plot was a real strong point in the final game and completely absent here. You wouldn’t even know the game had a comic book theme. All of this amounts to a level that could have been designed to delay, frustrate and not show the game in it’s best light. The graphics are still nice for the time but that wouldn’t be enough to have tempted me to buy it. The final section of the level, involves flying my newly acquired police car into a truly lethal area filled with tanks, more flying cars and a monk with an endless stream of Nova spells. My car only survives seconds in this environment and I have to make a beeline for the other side of the room and “hide” behind a rail fence which I learn is impenetrable to everything. From here I peek around the fence and use the only gun I’ve got that has any ammo left to take out the over-powered monk. A door to a small room opens up and there is a short message on a screen from Necrom stating that he has drawn me out so that he can run off again and wait for me. This is sounding like hide and seek to me but the level ends before I can start counting to 10. There is a quick advert screen to finish off the demo before I’m dumped back to DOS. I fully expected to enjoy playing this demo, and while it has it’s good points I can’t say that it turned out to be all that much fun. I wouldn’t like anyone to have judged the final game based on this, but I know I did and I can’t have been the only one. If I could have altered the controls, it would have made a huge difference but it wasn’t the most inspired level design either and I tend to think Origin would have been better off just using the first level of the game. If they had, maybe Cybermage wouldn’t be quite so obscure. This is from the December 1995 PC Zone. The DMZ is full of Necroms troops – they aren’t all that hard to kill but there are loads of them including these guys who have a particularly nasty range attack but die in a single hit with my lightning power. The DMZ is a war zone full of barb wire, fortified locations and the like. I run into Lana’s husband who I rescued from police hq yesterday. He doesn’t tell me much other than to head for the outpost as Necroms men are planning something big. I’ve got a particularly poor screenshot of it here but the outpost is a real war zone with tanks trying to break through the barriers and all the good guys trying to grenade them from their trench. I help out a bit and we break the siege. After breaking the siege I finally get to meet Katt himself who is commanding all the rebels out here in the DMZ. He tells me the Damma-cron is some sort of darklight neutraliser that I should use on Necrom when I meet him. It was intended to be used on me but the Sri-Feng have instead created the one weapon which can defeat him. He wants me to go to Necroms base of operations in an abandoned town at which point his troops will move in and seize it. Before I can get to Necroms base there is an extremely well defended area I have to get through with trenches, turrets, tanks and locked doors everywhere. I have to run down the trench and collect a coders globe. This then slots into here and activates a load of lifts which I can use to get into guard towers surrounding the trench. One of the guard towers has a level to get me into the next level. This is as well defended as ever and I’m fighting several tanks at once single handed. At the end I finally find Necrom himself. He seems to think that me being here means his plan has worked. He changes him mind when I Damma-cron him and runs away and sets more of his men on me instead. I find a switch to open up the big gate here and this lets all of Katt’s men into the base. Katt now tells me that Necrom must have a hidden base in the mountains which he has run off to. This is in the unholy zone where noone without darklight power can survive. He sends me into the old subway tunnels which go under the mountains and into the heart of the unholy zone. The level look very much like any subway but has more new things for me to fight including these flying lizards who throw fireballs. The subway soon gives way to caverns under the mountains, complete with this wobbly bridge which sways all over the place. This cavern is full of genno which I take out for the extra life force. I also come across giant beetles which are extremely tough. They don’t even up my stats when I kill them either. The caverns are largely featureless although they are big and full of powerups. I grab as many of these as I can and keep exploring until I find this room heaving with these little red guys. I learn a new skill from them (luna light). The downside is that this means they are casting it at me. There is a switch which opens up the cavern to the genno. If I hadn’t cleared it out before I could no doubt sit back and watch them kill each other off but instead I’m stuck doing this the hard way. I climb some ledges around the room with the red men and fall down into a tomb full of ghoulies. I find a secret button in here that gives me a bronze key. This opens up an area full of monsters. I also get a couple of +25 powerups for my trouble though. The exit to the level is just down from here. I climb a load of stairs and emerge in the unholy zone. The unholy zone looks strangely pleasant – all green and leafy but I expect it seem so nice when I meet the locals. The levels today have been a bit more run of the mill for an FPS, still fun but less interesting than some of the earlier ones. Cybermage doesn’t look to be quite the competitor for System Shock that I thought it might be early on but 3/4 of the way through I’d still rate it as the best 2.5D FPS I’ve played. Dark Forces or Duke Nukem 3D wouldn’t be that far behind but this is more varied and has elements that simply didn’t exist in those games.